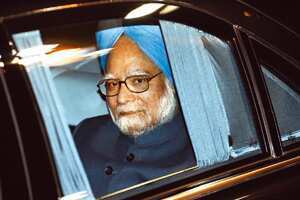 Tokyo: Prime Minister Manmohan Singh arrived here on Tuesday for a three-day visit during which he will seek to build energy and trade partnerships between Japan and India, although a key economic deal between the two countries won’t be signed for some more time. The new-found warmth between the two countries, described by The New York Times as the “Samurai and the Swami", was first visible in September when Tokyo overlooked its distaste for nuclear weapons and backed the Nuclear Suppliers Group’s decision to allow India entry into atomic commerce, despite opposition at home over India’s persistent refusal to sign nuclear non-proliferation agreements. The highlight of Singh’s visit, however, will be a decision to proceed with the so-called dedicated freight corridor, a project that seeks to link through a railway freight line, the country’s east and west coasts, and also envisages an industrial belt coming up along the corridor. Japan is also expected to commit $1 billion of official development assistance to India, mainly to a metro rail project in Chennai. Singh is scheduled to meet Japanese Prime Minister Taro Aso on Wednesday, but the two are unlikely to sign the Economic Partnership Agreement that India and Japan have been negotiating for two years. Aso and Singh leave for China for a summit of Asian and European nations later this week. “The agreement on the dedicated freight corridor will pour billions of dollars from Japan into India and has the capacity to transform the Indian landscape," said one Indian official, who did not want to be named. He indicated that an aid package to exclusively fund the project is in the offing. “This means that they’re treating us, at last, like a serious economy," this official added, pointing to a decision by the top Japanese chamber of commerce, the Keidanren—whose members include blue-chip Japanese companies such as Mitsui and Co. Ltd, Mitsubishi Motors Corp., Honda Motor Co., Toyota Motor Corp. and Sony Corp.—to invite the Indian Prime Minister for lunch. Aso said there was a clear need for India and Japan to deepen their economic relationship. “We cannot say that the size of their economic relations is large enough considering the size of their economies." Although the two countries trade in around $10 billion worth of products and services, India is Japan’s 27th largest trade partner. “We should, therefore, try to enhance drastically the economic relations between Japan and India through all means, and we have many bilateral economic cooperation on the agenda during Prime Minister Singh’s visit," Aso said. There are also reports that India and Japan could sign a security agreement allowing the Indian Navy to patrol the Strait of Hormuz so that Japanese tankers carrying crude can safely sail the Indian Ocean, while Tokyo returns the compliment in the Sakhalin region. On Tuesday, Singh was quoted by Japan’s Yomiuri Shimbum newspaper as saying that India was keen that it has “before the year is out...an agreement on a comprehensive economic partnership". The talks have dragged on for two years largely because of Japan’s unwillingness to grant access to Indian products in sectors such as pharmaceuticals, textiles and agriculture. Estimates gleaned from several conversations with officials from the ministries of external affairs and railways as well as the Prime Minister’s Office indicate that Japan could give India a soft loan worth Rs20,000 crore, which is about one-third the cost of the freight corridor project as estimated by the Japan Industrial Cooperation Agency (Jica). Another Indian government official said Jica had agreed to fund another one-third of the construction of the project, while the remaining money would have to come from the Indian Railways.